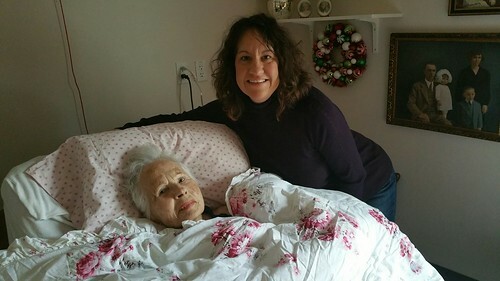 On December 2, my sister and I met up in Long Beach, California to have a visit with my sweet, 91 year old Gr’ma. When we got there, we were disappointed by her condition and situation. Without going into the whole thing, we ended up extending our stay and making arrangements for a change. December 21, Rick and I flew Gr’ma back to the island with us. We have one nursing home here and it turned out to be such a nice fit for my Gr’ma. The setting and the staff here were so different than the setting and staff she was dealing with in CA. Her nurses here were so kind and gentle with her, and the place itself has a homey feeling to it, rather than clinical. Best of all, I was able to visit and hang out with her every day. She flourished here. Well, maybe that is overstating it, but lets just say, her worst day here was better than her best day in her previous situation. I think it will never be clear to me what was happening there, but here she found peace and comfort and although I regret not making the change sooner, I am so glad that her last month was sweet and peaceful and pleasant. Her condition changed suddenly on Sunday and I spent the whole day with her on Monday, January 18, finally leaving after 10pm. A thoughtful nurse called me at 1am to say that her stats were dropping and I might want to return. Rick drove me back over and he and a nurse moved a comfy recliner in next to her bed so that I could be with her through the night. I held her hand and loved on her the rest of the night. At about 6:30 in the morning, I realized that she no longer seemed to be with me, but I could not really tell for sure. The room was still very dim and all was so quiet and peaceful. I did not want to leave her in case she was still passing, so I just sat with her and continued holding her hand, until Rick came in the room at about 6:45 and I asked him to request a nurse to come in. 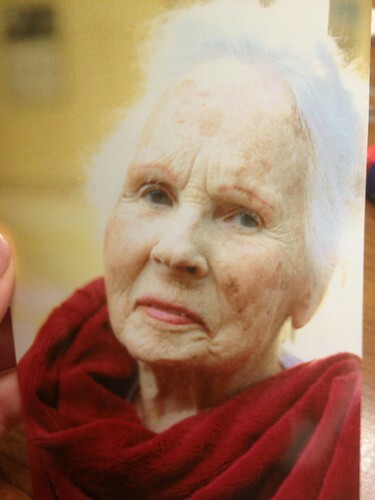 The nurse that came is a dear friend of mine, and she confirmed that Gr’ma was no longer with us. That is how peaceful her passing was. I did not even know for sure that she was gone. My heart was (is) so broken, but I am very thankful for the way it happened. She had no pain, just passed peacefully in a quiet, peaceful place, with a granddaughter who adored her holding her hand. The past couple of months have been challenging, but I am so glad for all the time that I got with my sweetie pie little gr’ma and I am honored to have been with her when she passed. My Gr’ma always made me feel loved and cared for and like a priority to her. As I got older (preteen and teen years), we would go visit her and some of my best childhood memories occurred with her. At that time, there were four of us grandkids, close in age, and she would fly us in for summers and we would whoop it up! Disney Land and Magic Mountain and Knotts Berry Farm and the beach and museums and movies and shopping and on and on. It was a big slumber party that lasted for weeks, with so many special times. It was not just all the fun entertainment and treats, but the care that she showed us all made me (us) feel so loved. Even things like laundry! We would wake up to clean, folded clothes as if she was some sort of magician. She would pack up simple but lovely picnics for beach days and she and Gr’pa always made sure we had “pocket money”. Once I was a little older, I even went on a date or two and would come home to a sweet gnite note on my pillow. I don’t know how she (and my Gr’pa) did all of that, but I know I am so lucky that they did. This entry was posted on Thursday, January 21st, 2016 at 3:08 pm	and is filed under Uncategorized. You can follow any responses to this entry through the RSS 2.0 feed. You can leave a response, or trackback from your own site. Aww Tiff, I am so sorry. I know how close you were with her. You and the family will be in my thoughts. I am so sorry for your loss. I can only hope that when my time comes, I will be surrounded by love like the love you had for her. Such a beautiful and loving tribute Tiffany. I feel as if I’ve come to know and love her through your story. May the Lord grant you peace in your memories. Thanks for sharing your last days with her with us. I had heard she was doing much better up there, and I am so glad you were able to be there with her and for her. ! She was my cousin and she will be missed greatly! Your memories of your grandmother are so precious…thanks for sharing a few of them with us. I’m with you in spirit. Prayers, Love and Concern always! That was a beautiful tribute. Although I never met her, I had tears in my eyes and am so glad you were able to have those last days together. My thoughts and condolences are with you and all of your family. So sorry Tiffany for your loss. It was my turn last August when my godmother (Auntie E) passed. I was able to spend some wonderful time with her before she passed. The empathy and sympathy I send to you and your family is so vivid.. Memories are wonderful things to keep close to your heart always! First of all, your grandmother is absolutely gorgeous and from what you say beautiful inside as well. I am so very sorry for your loss. You were very lucky to have her as a grandmother , and I am sure she felt the same about you. I wish that everyone could pass in the gentle way your grandma did with someone who loves them by their side. You gave your grandma the best gift of all, being surrounded by people that she loves and love her back. You already are a great mom and you are going to be an awesome Gr’ma, because you learned from the best. Tiffany, I’m so sorry about your grandma; what a treasure she was! God certainly knew what he was doing when He gave us grandmothers! God bless you and your sweet family.